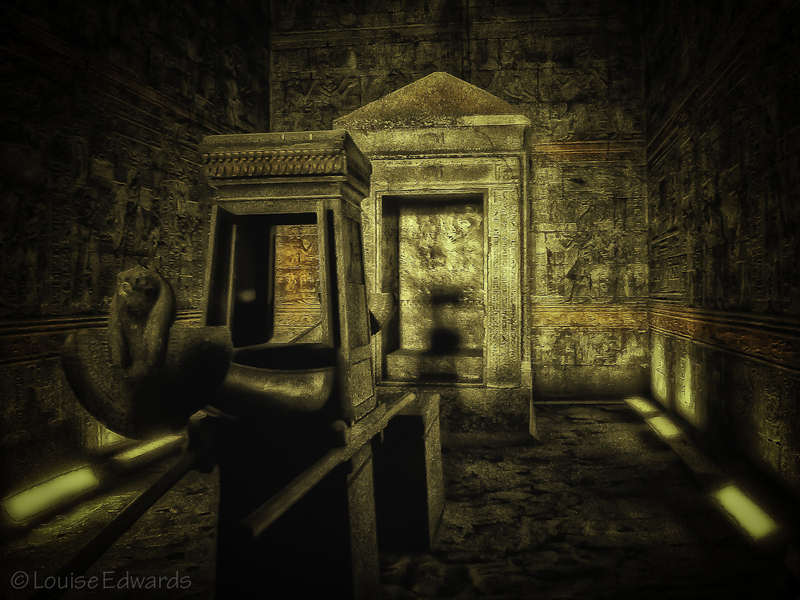 The Temple of Edfu was our next destination in Egypt. 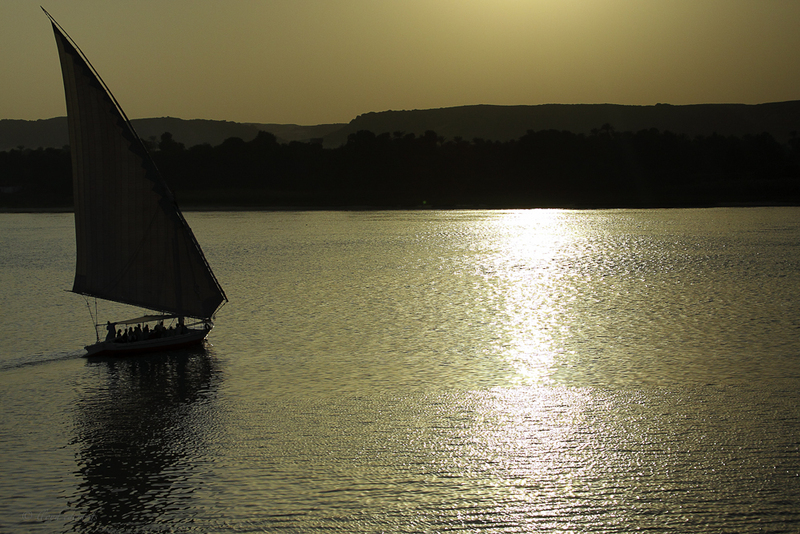 To date, our journey through Egypt has taken us around Lower Egypt (which is the northern part of Egypt, named for the direction the Nile River flows, not north or south, as the name would suggest). 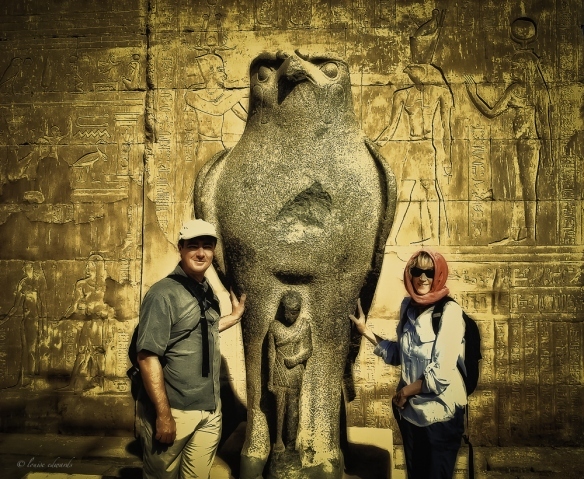 We began in Cairo spending two and a half days where we relaxed at the Mena House; off to Memphis to visit the open air museum, to Giza and Great Pyramids, and a camel ride under the full moon; then south a few miles to Saqqara where we saw the Step Pyramids at Djoser. Our second part of the journey, took us to Luxor (Thebes) via a short flight from Cairo where we saw the temple complex of Karnak and Luxor. Deir el Bahri where we would see the Valley of the Kings and Queen and the colossal mortuary temple of Queen Hatshepsut. That is so much to discuss even in two blogs, that I decided to break it out into five, because quite frankly, the blogs were entirely too long; it is my intend to grow readership not scare people away. Hopefully by doing this, people reading this blog will not only be on their toes, they will be enjoying our adventure as much as we did. I guess the name for this is living vicariously through us. 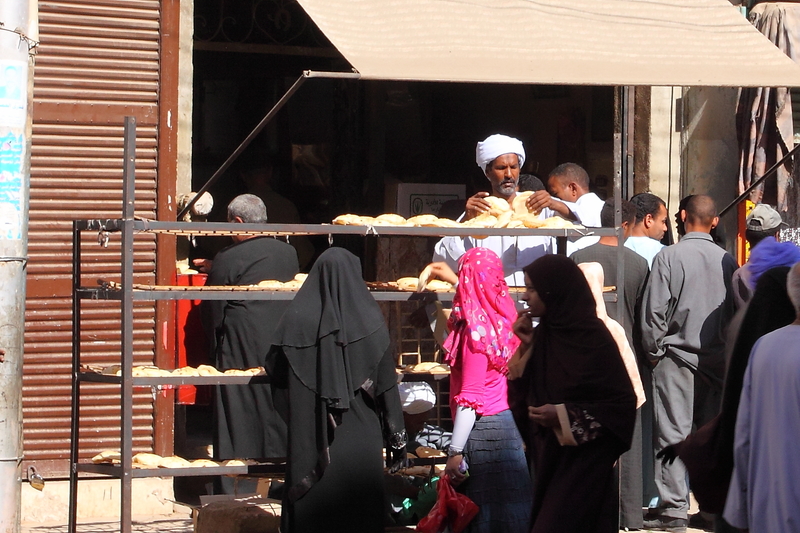 Pulling together the photos for the blogs brings back so many wonderful memories of our journey to Egypt. We actually were busy nearly the entire time visiting the many sites the country has to offer. 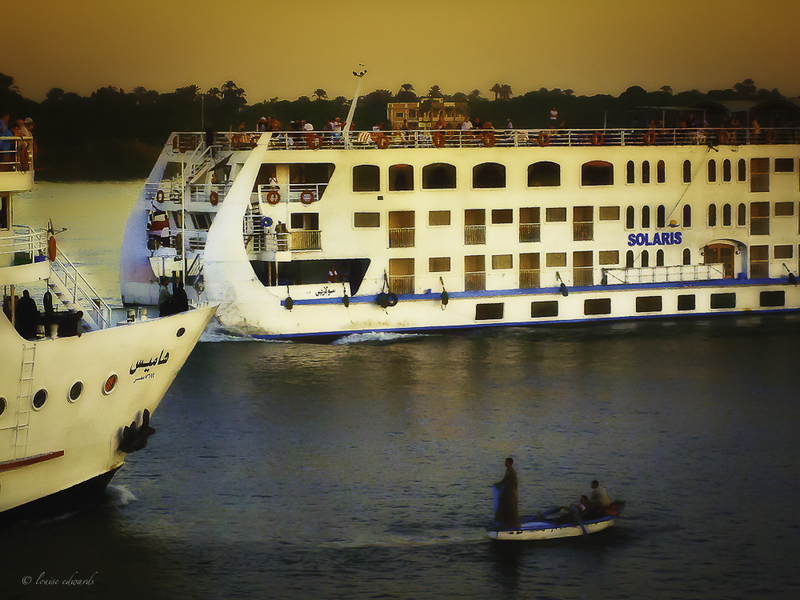 As our journey continues we will travel further up the Nile to Edfu. Our means of transportation – horse and buggy. Well, I can say, I had never taking a horse and buggy ride until we climbed in one to take to the Temple of Edfu. I actually thought it would be fun, instead, it reminded me of being stuck in the middle of a plane, having to pee, with no hope for escape. Thankfully, we were back far enough from the horses backside not to get sprayed by our horses digestive issues, which quickly made me thankful I lived in where we do, and in the era we do. What is with this poor animals in Egypt? First the camel now the horse? I tried not to think about it than as we quickly move on. Where is that etch-a-sketch? Street vendors lined the streets in hopes that one of the buggies would stop to buy some of their souvenirs. Believe me, they couldn’t wait. Personally, I was grateful for not stopping as much as our guide tried to get us to. Most of the shops, like the one above are pretty cheesy and not indicative of authentic dresses. I can’t imagine woman in ancient times wore such costumes even. The merchants definitely were targeting tourists, as no Egyptian woman dead or alive, ancient or otherwise living in today’s Egypt, would ever wear clothing as revealing or as cheap, as those costumes. They were very degrading. Seriously. The worse part, the tourists, flocked to these shops especially the beaded dress shop like seagulls to garbage. Seriously, who knew so many people would buy the crap, let alone wear it! Not an image I wish to recall. Three words – etch-a-sketch. 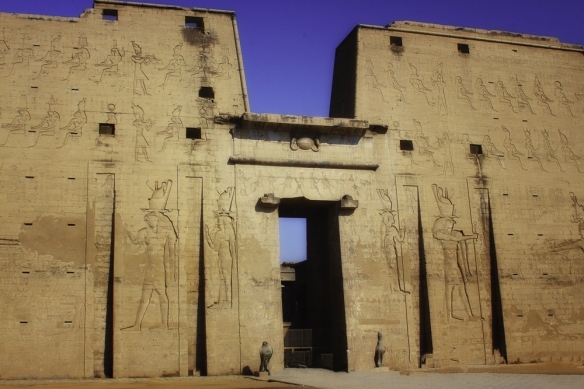 The following photo is the entrance to the Temple of Edfu. If you have followed my Egyptian series, many similarities are present among all sites. This holds true for the Temple of Philae constructed in a similar fashion to these other temples. The subtle differences seen in the design of the columns, particularly with the intricate designs at the top of each. Each new reign of Pharaoh brought with him an innovative archeological significance and intricate historical antiquities with them. I wonder if people living during this particular era in history ever imagined, their world would meet ours, in the form of tourist attractions. Or the mere discovery of such artifacts, or remnants of their world would be such an important discovery for not just the Egyptian people but various scientist and tourists from around the world. Their history or depiction of it, lives today through these artifacts. I doubt that our mark, (the Americans), in history will be our architecture as many of our buildings either fall down or demolished to build new ones. What I found a bit disconcerting was when the Coptic Christians or others made their appearance recognizable for them, they defaced many of the temples, constructed over many, and painted great murals over the walls, as they wanted to remove evidence of the previous ruler. 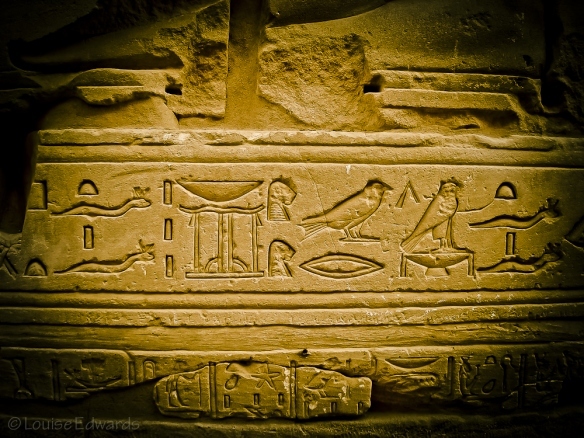 It is very sad, so many great hieroglyphs destroyed. We stood next to Horus which stands at the base of the entrance above, who had taken the form of a large falcon. He stands at the entrance to the temple. Here we are thanks to Tarek (our guide), and his photo-op. He shooed people away so we could have a photo without anyone around. He was good like that. Not that we really wanted to have so many photos of us posing in front of statues. I looked like a puffer fish; because, the trick to dressing in Egypt is – layers. I have on so many layers of clothes on, and at picture time, the bulk of them wrapped around my waist. This, because I wanted to look as flattering as possible. Right….I should have known Tarek would want us to have a Kodak moment. A great guide, his other clients must like to have their pictures taken, a lot. Needless to say, the photo of me sucked. Lloyd on the other hand looked chipper as a lark, or a falcon, like Horus, take your pick. Behind us, stood a handful of anxious tourists in the queue to have their picture taken. It was a freaking frenzy. I have to say. A very popular photo-op site. The only people who are going to see these are those who read my blog. Sorry. This photo of the grapes awesome! I found it tucked away with some other boulders. Seriously! 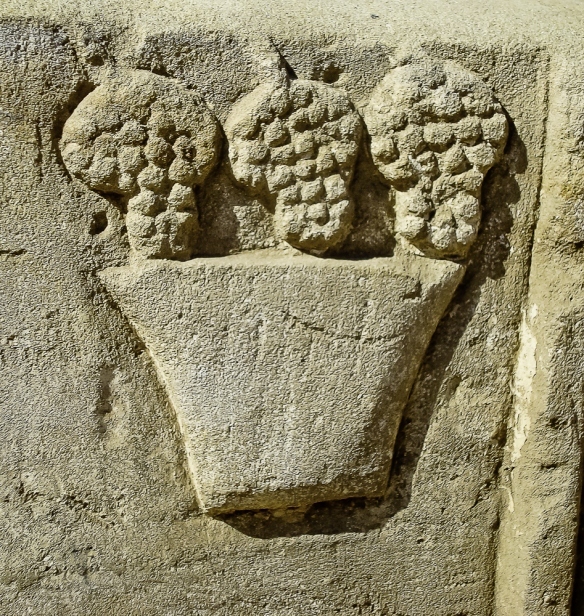 Let the Headlines Read, ‘Proof of Wine in the Southern Portion of Egypt!’ This photo was taken at the temple of Edfu. There is wine in Egypt, who Knew? We were anticipating a dry vacation. Nope! We were relieved and eager to try both the red table wine and their sparkling white and red varietals. I have to say, the sparkling was very good. The red, not my favorite, but definitely drinkable. My personal favorite was the sparkling rose (ro-say, not rose like the flower, although that might be nice. Probably not as wine). Inside the tomb was dark. The blackened charcoal colored columns indicative of a fire or to heat the temple during winter or for cooking, we were told. It merely makes a mind wonder (mine) and raises a plethora of questions. My mind tends to over think things at times. The scientist in me comes out every now and again. You can take the girl away from science but you can’t take science away from the girl, kind of thing. For example, there has never been a palace found to my knowledge. I would have expected the pharaoh to live in a palace. Has TV embellished the ancient royalty presenting the royal families living in such places, when they likely lived very similar to that of the regular population? I would like to believe that the ancient royalty lived like royalty in palaces similar to other civilizations, but no evidence supports this theory. Or perhaps the royal residences have yet to be discovered. That is the theory I would like to believe – the romantic in me. The scientist believes the royal families lived in homes made from mud blocks similar to the regular people. Perhaps they had more lavish mud homes. Or perhaps the scientists have it wrong, the mortuary temples were also places which housed royal families. I would love to read more about this theory. 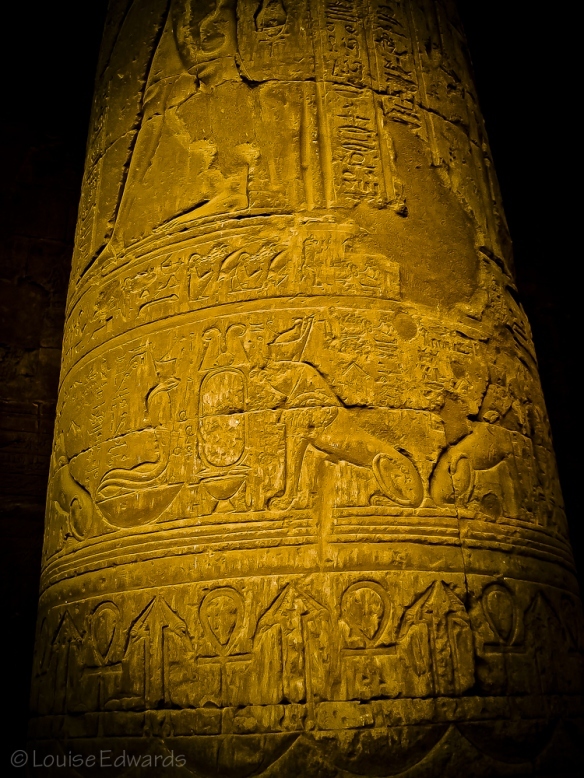 The image above is a column inside Edfu Temple and one of my favorite images I shot during our journey. 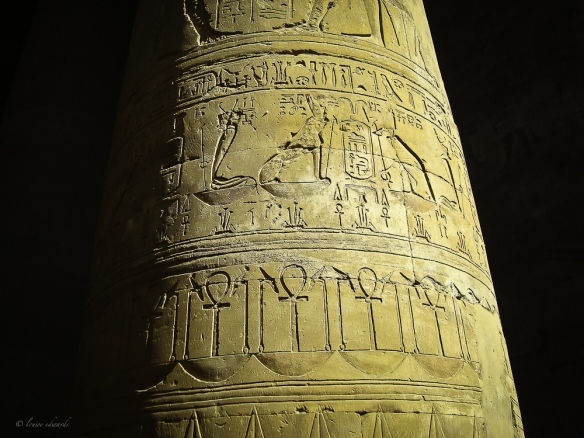 This, Anubis (the first image on this post) and Ramses (from Part I, of this series of posts). It is simple and not overdone (as are the others). The room dark except for the sunlight that captured the Ankh symbols perfectly. It is all about the lighting. Perhaps that is one of the reasons I like it. It’s like Cindy Crawford, she doesn’t need any makeup to look great. She merely is. These images are a bit darker as they were shot from inside the temple as well. 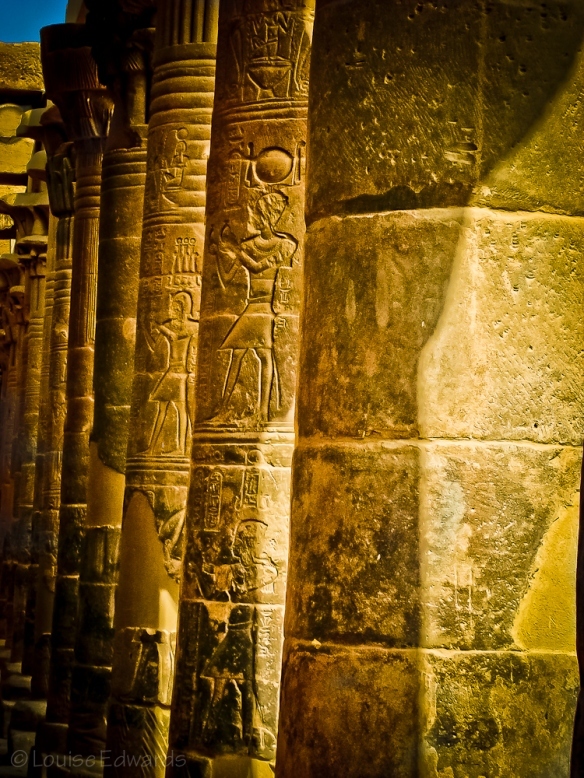 The lower columns depict a lion and an ankh, The lion represents strength while the ankh represents good luck. Such intricate craftsmanship. It was amazing to stand inside these temples. My hand couldn’t wait to caressing the lines of the grooves and crevices of the glyphs. ‘Golden Tomb at Edfu‘ was absolutely amazing. I was so stoked when the photo turned out. This because I was literally tossed in the crowd not much different from being in a mosh pit, but not as rough. This part of the tomb saw a lot of people. All of whom wanted to take a photo of this, or have the photo taken with this. ‘This’ was inside the inner sanctuary embellished in gold, pure as the designs and intricate workmanship. Its true meaning in question. All I knew was it was beautiful. ‘This’ was the types of antiquities I had expected to see throughout Egypt in the tombs. I thought that there would be mummies and sarcophagus left in the tombs, and upright sarcophagi in the tombs, filled with mummies. I guess only in the movies. I realized of course they couldn’t be left in the tombs or sanctuaries as this would result in vandals. So imagine my surprise to see ‘this’ antiquity used to carry the body to the tomb, I believe. Don’t quote me. I can’t even remember what ‘this’ was called. As the day ended, we had but one day remaining to see the sights before returning to Cairo. On the way back to the ship we passed the shop below, that sold bread. Our guide quickly jumps from the buggy and runs to the stand. Best bread ever he says, upon his return. We never tried any, we took his word for it. As he placed the bread on the filthy buggy seat unwrapped and uncovered.Two words e.coli. Fresh bread for sale. just hanging out in the sun with all those fingers on it. Yum. 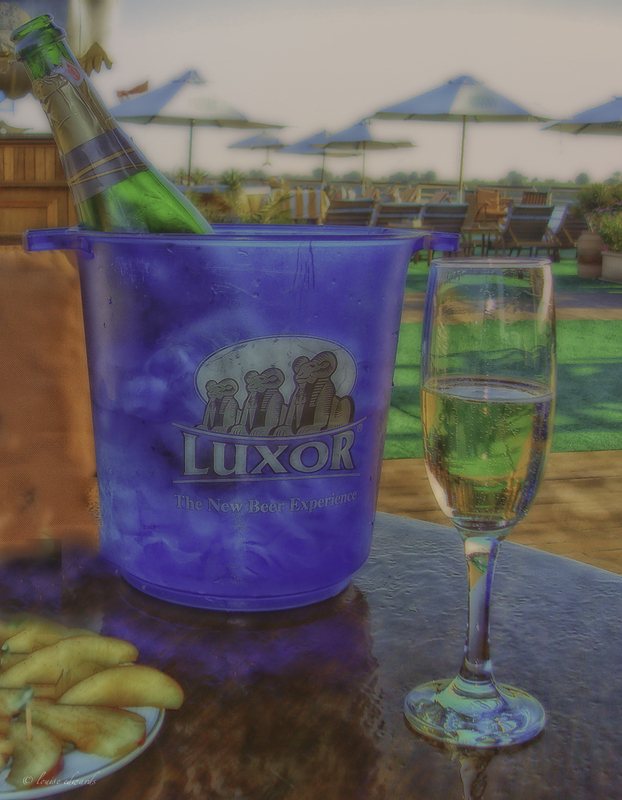 The next part of the trip entailed a few hours on the upper deck with our new best friend – ‘Egyptian Sparkling Wine’ by the pool. Or under the awning, next to the pool, so we did not fry under the intense rays of the sun. The sun is brutal, even in winter. This was the way to relax. As we sat out on the deck was the first time we saw so many cruise ships, all in a cue to enter the locks. We also heard yelling from below. ‘Layday, Layday’, I peaked my head over and was nearly knocked off my feet by a flying bag filled with a cheesy mans shirt or dress. I tossed it back, it missed his boat and ended up sinking. The man was not happy. I shrugged my shoulders. Sorry. I said I wasn’t interested in purchasing anything, repeatedly. By this time I looked over the deck and there they were, probably ten or so small boats like the one below. These men would toss-up in plastic bags packages of rugs, scarfs, and Egyptian costumes. If you didn’t want what they tossed up then you tossed it back down. I was not well skilled with the technique. Each time something was tossed up, I tossed it down, and in the water it would go. I missed the boat, literally. Each time! I felt horrible. One bag actually sank. The man, not happy. At the last moment the money came. Enough money for one. Really! I could buy only one? I wanted to buy more… questioning the money situation in my inside voice, I quickly packed up the money in the bag and hurriedly tossed the bag overboard. What can I say, it missed the boat. Into the Nile it plunged. What can I say? I can’t throw, not even a simple bag overboard into a boat. In the end, all was good, someone in another boat retrieved the money before it was too late. When I unwrapped my purchase, I really did wish I had bought more. It clearly was not meant to be. I wasn’t sure how I was going to pack the throw rug, let alone more. I had packed a smaller suitcase than Lloyd. I hate carting luggage. The less the better. The rugs were hand-made and pretty thick and more like a throw rug or heavy blanket. Beautiful. I wasn’t sure why so many people bought the cheesy Egyptian clothing when they could have spent 8 dollars on these great throw rugs. But the cheap Egyptian costumes, sold better than hot cakes at a Sunday morning brunch. I guess they would wear the costumes to the party that night. Where else would someone wear an Egyptian tunic? 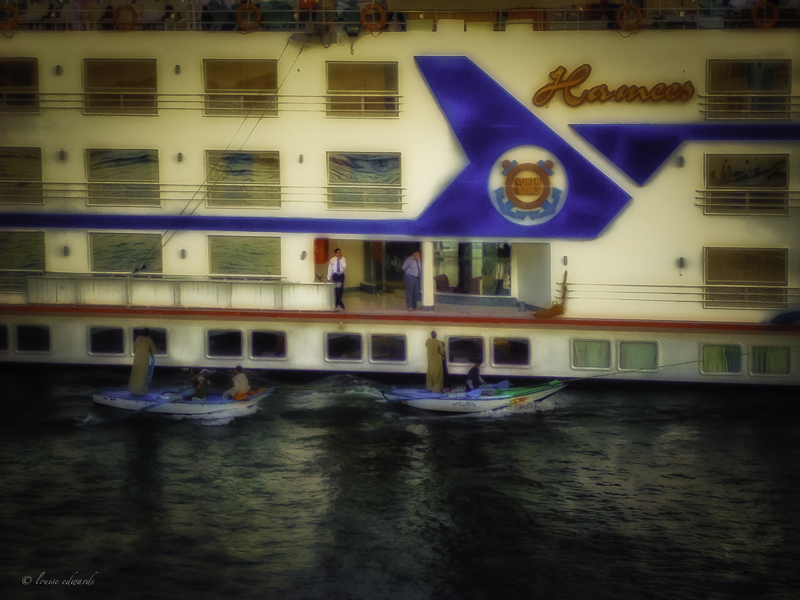 As our boat had its turn through the locks we continued our way up the Nile. 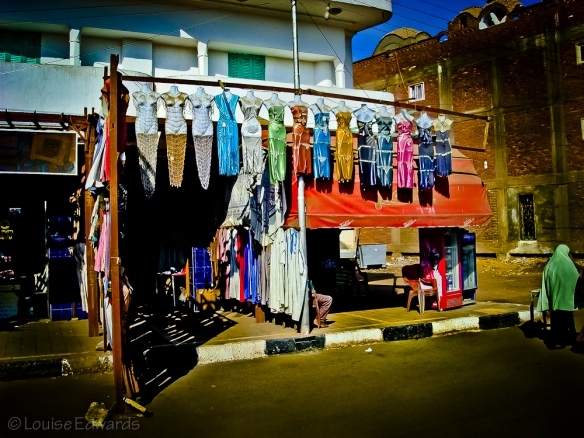 People who failed to buy their costumes on board the ship in a tiny shop, or from the street vendors along the way to Edfu Temple, purchased their costumes from the boat merchants. It was costume night on the ship. People dressed up in their costumes for dinner. Some really did a great job looking cheesy, some looked very slutty, while some of the men – pathetic. The best was a man with a toga and those old fashion white socks with the strips, just below the knees, wearing sandals. It was brilliant! If I wouldn’t have been so obvious, I would have taken a picture. The best part this woman, older than me, perhaps a few years younger than my mother, probably. Sadly she wore the beads and not much else. It was not a pretty site. The man with the socks and she, I believe the two were married. Yikes! People were into purchasing this merchandise they would where once, from the cheesy shops. I needed the etch-a-sketch again to get the woman’s costume from my head. We learned each ship has a costume night. 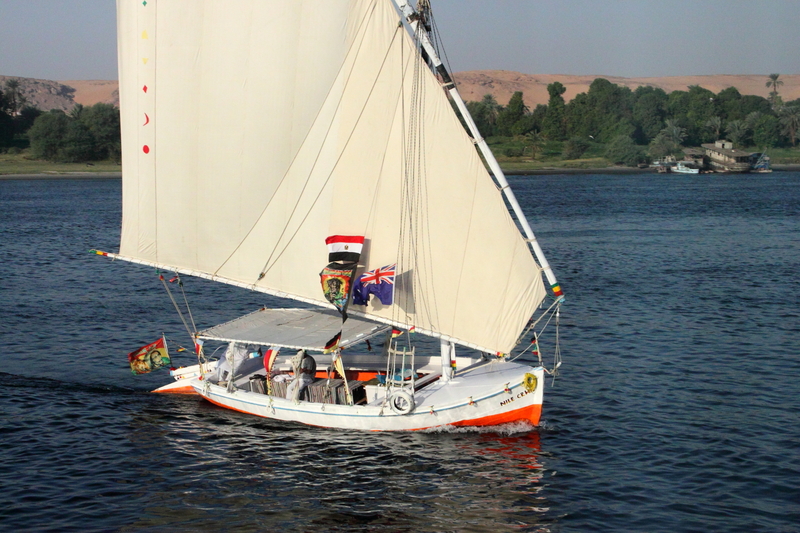 We bowed out of the fun, I am so sure it was; Instead we found our way to the upper deck with our bottle of delicious Egyptian sparkling wine and watched the stars as the ship sailed up the Nile to Aswan. We learned the fleet comprises some 200 boats. All on the River at once traveling the same River. It was odd however, as we rarely saw another ship unless we were docking, at night, all the boats would line up and hook together. Our ship was one of a few that had its own dock. This meant an evening of quiet, the other ships were loud because of their generators were older and loud. ‘Rastafarian Falluca,’ being Australian, my husband loved this falluca with the Australian flag. This was our view before dusk. It was lovely night. A bit chilly, but after a couple of glasses of sparkling wine, who cared. Our view on the Nile while the others were off partying. This photo of the falluca taken by Lloyd as the evening disco music began. The view, far superior to disco dancing. 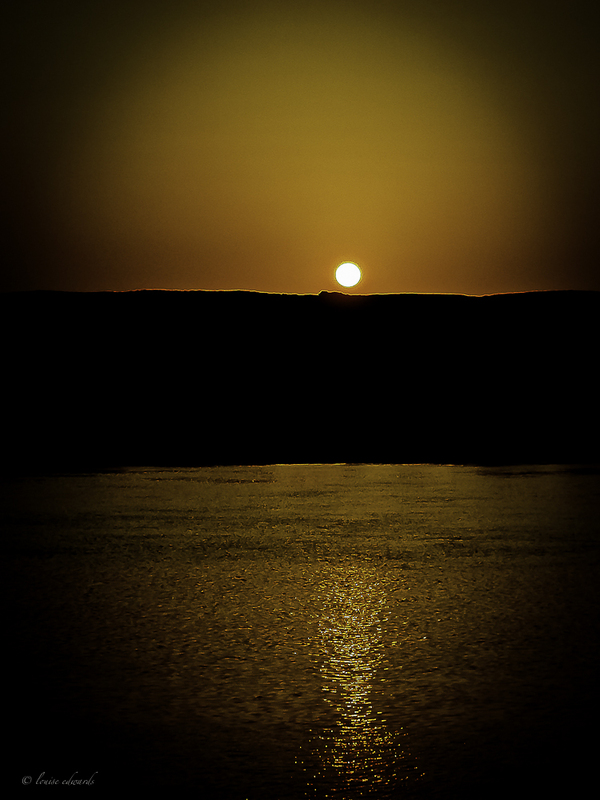 What better means to end this post than with two sunset shots of the Nile. Let the disco balls spin. Lloyd and I sat back and took in the quiet of nature. I would prefer to watch the sun set, relax with a glass of sparkling wine while the men and women were down on the main deck dressed in scary costumes, dancing the night away and singing karaoke. I hope you enjoyed our journey to the Temple of Edfu and you will return for the final segments of our Egyptian adventure From Portland, Oregon to Egypt, where we will visit the High Dam, glide across the Lake Aswan to the Temple of Philae and return to Cairo for our last few days. I was saddened that we only had a few short days remaining. But what a fascinating time we had. Definitely a trip worthy of the number one place on anyone’s bucket list.